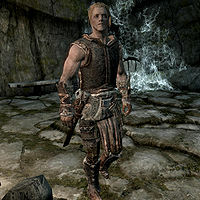 Golldir is a Nord warrior found outside Hillgrund's Tomb. He will appeal to you for help in stopping a necromancer, Vals Veran, from defiling his dead ancestors. After the related quest, he will remain outside of the tomb and becomes a potential follower. If he is recruited for the Blades, he will relocate to Sky Haven Temple. Golldir wears a full set of iron armor, excluding the helmet. He is equipped with a leveled war axe and a leveled shield. He also carries the key to the tomb entrance, a note, a letter, and three random leveled potions of either restore health, restore magicka, or restore stamina. "Ah! Oh, by Kyne you startled me." When you first approach Golldir outside, he will exclaim: "Ah! Oh, by Kyne you startled me. There's a necromancer around here so watch yourself." He will then initiate conversation with you by saying: "Can you help me? He's in the tomb doing Gods know what with my dead relatives." If you say that you haven't got the time, he will tell you: "Fine, but I've locked the door so don't think you're getting in there without me." Also asking about who's in there, he will provide more detail about Vals: "Vals Veran. My family has never really seen eye to eye with him and he has finally gone off the deep end. He's gone in to defile our family tomb by using our ancestors for his filthy dark elf necromancy." If you are also a Dunmer, he will quickly apologize: "No offense, I mean I'm sure you aren't into any of that kind of stuff." and continue to say: "My aunt went in after him, but she hasn't come out yet and I'm afraid to go in by myself." If you also ask why he let his aunt go in all by herself, he will explain: "Sigh... I'm not proud of it. I'm terrified of that place and Aunt Agna knows it. My Da locked me in there in a drunken rage when he left us... three days in there eating the offerings left for our dead before Aunt Agna found me." Once you finally agree to help him, he will exclaim: "Great! I'll unlock the door and meet you inside, then you can lead the way." He will then unlock the door leading into the tomb, and you are now directed to proceed inside. "We're not killing them, they were already dead." 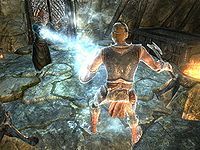 Once you are inside the tomb, Golldir will tell you: "We should get after Vals Veran before he does more damage here." You can also take the time to ask him if he cares about killing his ancestors, to which he will reply: "We're not killing them, they were already dead. We're helping them back to Sovngarde." If you also tell him to proceed onward, he will exclaim: "That dark elf is about to be a dead elf." or "Vals Veran will die for what he's done." Golldir will now become a 'temporary' follower at this point. 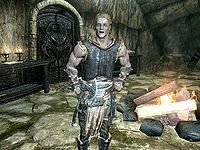 Proceeding onward, if Golldir catches you taking any items from the tomb, he will allow you to keep them, but will say: "Hey! Those belong to my family! Sigh... fine, take whatever you want, so long as you help me get rid of Vals." Once you find Aunt Agna's body, he will exclaim: "No! Aunt Agna! Talos, why didn't I go in with her?" Attempting to open the door, he will also state: "He's barred the door. Gods only know how he's... defiling the bodies of my ancestors in there! Agna once told me there is a secret room deeper in where they buried disgraced members of the family. Maybe that will get us into the main chamber..." If you ask him where the secret door is, he will say: "I'll tell you more about it when we are nearby." "I'll return my ancestors to Sovngarde, and you with them!" Vals: "The dead should be made to serve the living, not the other way around!" Golldir: "I'll return my ancestors to Sovngarde, and you with them!" 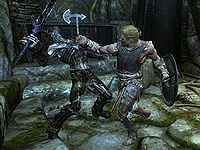 Vals: "Sovngarde is a myth, you s'wit! And now you can join your ancestors in service to me!" Once Vals is dead however, Golldir will thank you: "Thank you for your help with Vals. Please, take this and leave me to see to Aunt Agna and my other family members." If you approach him again he will tell you: "I have things to see to, but go ahead." If you ask him what he will do now, he will inform you: "Whatever I can to put my family here back to rest. After that? Probably just stick around here. Saw some good game on my way here, and I'd like to stay close for a while." If you say goodbye to him, he will then thank you again: "Thanks again for your help." Even though he states that his "da" locked him up in the tomb when he was young, the note from his Aunt Agna mentions his brother locking him in instead. This page was last modified on 23 October 2018, at 10:26.